As early as 1950 Brother Branham felt that one day God would call him to go to India. So great was his burden for South Africa, India and the Eastern countries that, for over four years, he constantly made reference to his impending trip to these countries. Now, .....I pray for the sick. And I trust that God will make Hisself known to you tonight in a great marvelous way. Now, we just have a few nights left in this meeting, this campaign. The good Lord willing, Monday, we leave for Zion, Illinois. And just from there, I'm just kind of going on impressions, the way that He seems to be leading me. I had one meeting that I'm going to. I know where that meeting is. That meeting - one of them in South Africa, the other one is in India. And that's going to be a real meeting. That's going to be where God Hisself known to three hundred thousand people. Now, it is no longer an impression on the Prophet's heart - it's "Thus Saith The Lord" by a Vision. But still, unknown to Brother Branham, the vision was almost three years from fulfillment. He was becoming more and more anxious concerning these meetings. I came to myself. I heard His number. Remember, I'm going to hold a meeting somewhere east of Durban, I believe in India, that'll consist of three hundred thousand people. That's before it comes to pass, that you might know. Having just passed through a tremendous Revival in South Africa, Brother Branham lived daily in anticipation of the Revival he would have in India. Two more years would pass before it would become a reality. He felt that 1954 would be the year for India. As early as February 1954 he was becoming over-anxious and had begun to make plans for the trip. The Lord stepped in by a vision and told him the exact month he would go to India. So I was on my road back (home) to go in to minister to the people again, and standing in the door stood an odd dressed man. I never noticed how he was dressed down this way, but he had like a towel laying over his head. His nose was kinda pushed up, in that manner. I said, "How do you do, sir?" I thought some of them had just let him in. He was in there to be prayed for. And he looked up like that, said, "Brother Branham, don't go overseas till September." I said, "Why?" And the man was gone. And I went into the other room, and asked if they had seen anything like it; wife hadn't let him into the house; No one knowed nothing about him. And then that night, after the house was empty, I went in and was laying down along about one o'clock in the morning, and I dreamed that I shouldn't go over to India until September. I come in, woke up my wife, and told her. We set there a little while, I went back in again and dreamed the same dream again. And we said, "Maybe it's the Lord, don't want me to go over." And I went in, I said, "Lord, then I accept the vision as being You warning me, and the two dreams also not to go till September." I went to sleep and slept like a baby. So we go in September in the Name of Jesus Christ. Watch what happens. I know our Lord will be good to us. He promised it. During the space of just over three weeks he had visited Portugal, Rome, Trans-Jordon, Egypt, and Greece. Along the way he had met with the Kings, Queens and Rulers of certain countries. His last stop before returning home was India. There he had met with Prime Minister Nehru and members of the Indian Parliament. When I went to Bombay, I count that my greatest meeting because of the effects it had on the people, If in Africa they say thirty thousand came to Christ at one time, then there was a hundred and fifty or two hundred thousand came to Christ at one time out of that half a million there. What could I do? There wasn't a thing. Perhaps maybe, say there was, just say there was a hundred thousand of them. There was no church, nothing I could do. There was nobody to give to them the Message that I believed, there wasn't even a Pentecostal denomination would cooperate with me. And all those souls probably drifted right back into Shiites, Jains, Buddhism, what-ever-more they come from. No place to put them. Now that's a shame, that's a disgrace. See, because I had no cooperation, because of the stand that I take. hat afternoon when the Holy Spirit came down at the meeting in the racetrack and begin to reveal the secrets of the heart, after I had took the Scripture. About an hour, where it really taken me fifteen minutes, 'cause they had fifteen different interpreters for it to go through. So I'd speak like, "Jesus Christ the Son of God;" and this one say, "bah, bah, bah, bah, bah;" this one, "gloo, gloo, gloo, gloo;" and then, "um, um, um," like that; all meant "Jesus Christ the Son of God;" interpreters. And I'd have to jot down what I said last, I wouldn't know where he was at, and then wait till they got through. And then when it got back, I said, "Now, the missionary told you of a Jesus that come to save you." You see them looking at one another, you know, different tribes, and all the way up and down like that. I said, "The missionary told you that. But did that missionary... In reading this Book, did you see there where He was a great Healer and said that He would live down through the age in the people till He come again? 'Works that I do shall you also.` You that's ever accepted Christ as your Saviour, with those tags on, would you like to see Jesus come back up here today and walk down through the people and do the same thing He did when He was here on earth?" Oh, all of them, "Sure!" They wanted to see that, you see, They wanted that. "Oh, sure!" You see, the Mohammedan setting out there. The second person on the platform was a Mohammedan woman. The Holy Spirit speaking, I said to the woman myself, I said, "Now, you know I don't know you, I can't even speak your language." And she admitted that. She had the red dot right in between her eyes here, which meant she was a thoroughbred and a Mohammedan. So, I said, "Well, now, for healing you, I cannot heal you." But I said, "Did you understand the... what I said this afternoon, the Message?" And she talked back to the Mohammedan interpreter... She said, "Yes, she understood, she had read the New Testament." Oh, yeah, uh-huh. See, they believe in God, too. They're the seed of Abraham, also. See? But said then, "She believed in God, but she believed Mohammed was His prophet." And we believe Jesus was His Son. See? So she said, "Oh, she believed God." And I said, "Then if you know the Old Testament and know what God was in the man gone by, in the ages gone, then Jesus, One that we call 'the Christ,' was to be the God-prophet. Yeah, they killed Him. You think they didn't 'cause you said he got on a white horse and rode away. That's what you're taught by your priest, that, 'He never was killed, now. And he died a normal death somewhere else, years later.`"
I said, "You believe that. But this Jesus, according to the New Testament, He died and rose again, and sent His Spirit back on His Church." Now you got them, see. That's exactly what that Mohammedan challenged Billy Graham about, see. Same thing, same principle. I I said, "Now, Mohammed never made you an any promises. But Jesus made us a promise, that the same works that he did we'd do also. Now, you remember He said in St. John 5:19, 'I do nothing till the Father shows Me.`" And I said, "Now, if Jesus will come and show me what your trouble is or what you're here for, tell you what your outcome was, what your past was, and what your future will be, and if He can tell you what your past was, surely you'll believe what the future will be." And all them Mohammedans just raising up, watching, you know. And when the Holy Spirit said, "Your husband short, heavyset man, with a black mustache, You was at a doctor, about three days ago." Said, "You got two children. He give you a female examination, he said, 'You had a cyst on the womb." She looked down and bowed her head, she said, "That is truth." And I said, "I can't help you. But if you'll accept this Jesus Who is here now, Who knows your life and knows all about you, He will help you." That did it. That was it. Ten thousand Mohammedans come to Christ that afternoon. See, about thirty years on the mission field, and it turned one over by literature; where in five minutes time, ten thousand come by the Gospel being made manifest. 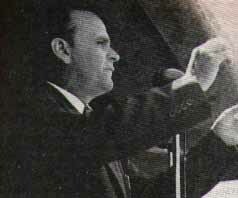 Adapted from the book, published by Voice of God Recordings, called "Footprints on the Sands of Time", which is a compilation of excerpts, by William Branham, taken from over eleven hundred tape recorded sermons.